A team WOD named after the most unlikely team of Marvel heroes formed from a group of outlaws! 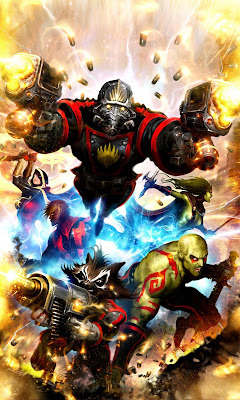 The movies seem to be coming together similar to the comics, in which the Guardians of the Galaxy team up with the Mighty Avengers to fight Thanos! So feel free to text your favorite workout partner and try to get them to come to the same class as you to tackle on this workout! Alternate partners each MOVEMENT. Time cap of 20 minutes. Record time. *Rest between rounds UP TO 3:00. Weight should be heavy enough that 1:00 rest won't be enough rest and 2:00 may MAY be enough after the first few rounds. *Rounds 1-5 build up each round and maintain constant load for rounds 6-10.